Image caption President Ramotar, casting his vote alongside his wife Deolatchmee, said he was very confident of victory. 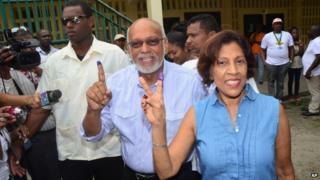 Guyana has voted in general elections described by police as steady and peaceful. Incumbent President Donald Ramotar of the People's Progressive Party - Civic (PPP/C) is running against David Granger, representing a five-party opposition coalition. Mr Ramotar's party has been in power for more than two decades. If the PPP/C wins, it will be its sixth consecutive term in office and the second for Donald Ramotar. Casting his vote, Mr Ramotar said his party would keep its majority. "I am confident of victory," he said. "Very." Guyana is ethnically divided, with people of Indian descent historically backing the PPP/C and those of African descent backing opposition parties. Mr Granger, a 69-year-old retired army general, ran against Mr Ramotar in the last presidential election in 2011 and lost. But he sounded a confident note, "We really want to establish a government of national unity that will make people feel that it is inclusive." he told reporters. Image caption David Granger said after casting his vote he thought his party would win 58 percent of the vote. There were no independent opinion polls ahead of the election. The campaign has been acrimonious, with the opposition accusing Mr Ramotar of corruption and mismanagement. Opposition members of the 65-seat National Assembly blocked funding for a number of projects backed by President Ramotar over the past years. After he defied budget cuts, opposition politicians in the National Assembly called a vote of no confidence. Guyana is the third poorest country in Latin America after Haiti and Nicaragua, according to World Bank figures. It has one of the world's highest emigration rates - more than 55% of its citizens live abroad. Mr Ramotar said that his party's record spoke for itself and pointed to the steady economic growth Guyana had been experiencing in the past eight years. Mr Granger has campaigned on a platform of increased security and fighting drug and human trafficking. Official results are not expected until Wednesday because of the difficulties in transporting ballot boxes across Guyana's rough terrain.